Home / Adhesive Tapes / Teflon High Temperature PTFE Tape / Teflon PTFE Glass Coated Cloth High Temperature Non Stick Tape YOUR SIZE, YOUR THICKNESS! 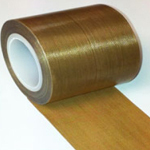 Teflon PTFE Glass Coated Cloth High Temperature Non Stick Tape YOUR SIZE, YOUR THICKNESS! Tell us what you want, we can do it! We will not be beaten on Price! Guaranteed!